So, you’re finally moving to a place. Are you excited? We hope so! After all, even though moving can be somewhat of a pain, a new place means an incredible opportunity to get a fresh start. But before you pack up your U-haul and set up your new home, there’s still some business to take care of at your old place. Many renters don’t take into account the details and tasks they need to face before moving on. This can be a big mistake! If you don’t take the time to clean and properly tend to your old space, you could run the risk of having to kiss your security deposit goodbye. Many landlords may hire cleaning companies to do a deep clean sweep of the old spaces. Even so, however, it’s important to revisit your lease and see what’s expected of you, the tenant, at move-out. Check the fine print. Will there be cleaning and/or maintenance fees? Exactly how clean does your landlord need the apartment to be? It’s important to sort out these expectations so you’re not blindsided by nagging phone calls, hidden fees, and — worst case scenario — the loss of your entire security deposit. Here are a few tips to help you deep clean your old space as well as you can, to help ensure that security deposit goes exactly where it belongs — straight back in your pocket! In order to get that full security deposit back, you’re going to have to be thorough in making the place look like new again. From deep cleaning the space, to fixing up small bits of damage, to double checking your efforts to make sure you didn’t miss anything, a little elbow grease can go a long way for your wallet. An early step to take is to simply acknowledge that you may have to take on some cleaning chores. Be ready to add common cleaning tasks to your move-out to-do list — including focusing on getting everything that should be out of the space out of the space. This may seem like an obvious point, but you’d be surprised how many little things can linger, even after you think you’ve packed up all of your belongings. Double check all of the closets, scan your dark corners, and do a sweep of hiding spaces, like utility cupboards, cabinets, the storage area under the sink, the pantry, and under big appliances like the refrigerator or oven. The more debris you’re able to get out, the less chance you’ll get a phone call telling you that you missed something, right when you should be settling into your new digs. Bedrooms: Work using a “high to low” mindset — that is, start with the highest spots in the room, so that when you knock down dust and debris, you can sweep them up when you tackle the “lower” jobs later. Wipe down ceiling fans, closet shelves, and the tops of doors, window frames, and molding if you have it. Check for cobwebs in ceiling corners and on other parts of the wall, and knock them down or vacuum them away. Clean the windows, taking care to get the window frames, as well as the tracks. Spray generously with all-purpose cleaner and mop up with a sponge or a rag. After you close them up, use a glass cleaner to get off the gunk. Depending on what type of blinds or curtains you have, you can clean by hand or bust out a vacuum. For other types of durable blinds, you may be able to pull them down and soak for an hour or two in a tub filled with warm, soapy water, then rinse and hang to dry. For the low in your high-to-low, wipe down baseboards and sweep and/or vacuum the floor, working backwards to avoid tracking dirt or dust. Keep with the high-to-low theme, as you did in the bedroom. 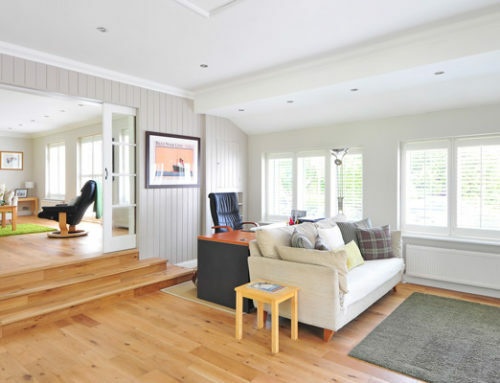 Move from ceilings and high corners, to the trim and molding, wipe down vertical surfaces such as windows or walls, and then turn your attention to the baseboards and flooring, and all of the debris you’ve knocked down from on high. The oven may be one of the most thorough cleans you’ll have to do, so be sure to set aside a fair amount of time for it. First, make sure that your cabinets and drawers are clean, and free of any debris. Wipe down the interior and exterior of these storage spaces with your favorite all-purpose cleaner. If you have a dishwasher, do a generous inspection and, if in need, do a quick deep clean with a wash of vinegar. Next, clean the appliances, including the oven and refrigerator. Start on the outside, wiping or scrubbing down the exterior as needed. Don’t forget the stovetop! Do a complete fridge gut: pull out all the shelves and drawers, wash them with soap and water, and put out to dry. After wiping down the sides and shelves of the fridge door, work from (you guessed it) top to bottom. Wipe it all down with a clean rag or paper towel before putting it all back together. Finally, wipe down counters and sweep/vacuum/mop the floors. Clean the sink with a wipe down. Be ready to scrub all over. Scrub down the shower/tub and if you have tile, tend to the grout with a toothbrush to get to the nitty gritty. Wipe down the kitchen sink, as well as faucets and the tub/shower floor. Vacuum in any cupboards for remaining debris. They may need a wipe down as well with cleaner. Move to walls and windows, and clean with your favorite bathroom cleanser. Clean the toilet thoroughly. In addition to getting to the bowl with toilet cleaner, be sure to lift up the seat and wipe down under there as well. You may also want to clean that hard-to-reach spot behind the toilet, for good measure. 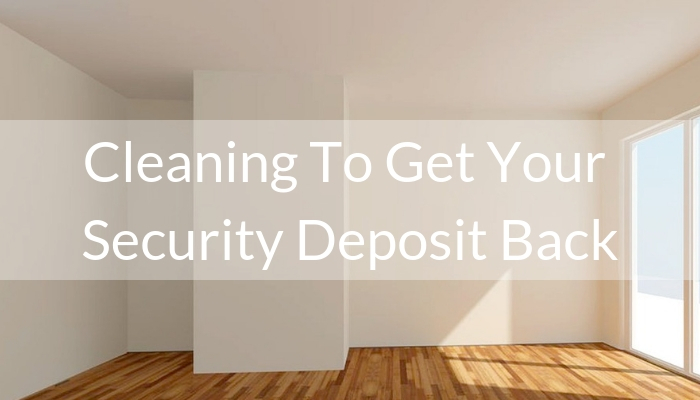 Even after you’ve done a good clean sweep, don’t forget to look for those last remaining details that could still affect that security deposit. You know what we mean: Scratches on the floor, small holes in the wall from hanging decor, tears in the carpet… These are the small things you actually may need to sweat. One simple fix may be to do the repairs yourself, if you have the skills and the budget. You may need to spend a little bit of money, but it could actually save you more money in the long run, if your landlord ends up using the little details to raise a big fuss. With that said, don’t take on a major repair job if you’re not comfortable putting in the fix. Don’t risk causing more damage to be dealt with! Similarly, it may help if you can document that a particular spot was damaged when you inherited the home. If you took pictures or notes on “trouble spots” before you moved in, be prepared to show them now. So you’ve done it all: Assessed your lease, deep cleaned from top to bottom, and tended to those small repairs, to ensure everything is seamless and like new. Even so, you may want to take extra caution when moving out to ensure you get the full deposit back. As we all know, some landlords and management companies can be very particular. You also never know what can happen once you leave. For instance, a maintenance company that comes in could leave a mess during a small repair, or an appliance delivery could lead to scrapes and marks that you had nothing to do with! Go the extra mile before you hand in your keys and take pictures of the space after all your cleaning and fixing up to ensure that you have proof of all your hard work. 5.) Don’t Be Afraid to Hire the Pros! When it comes to taking on a deep clean, you should be realistic about what you can tackle on your own, and what you should turn over to an experienced, professional cleaning service. WHen it comes to getting that security deposit all squared away, consulting a cleaning professional can help you save time, and ensure the best possible outcome. A little help could go a long way, leaving you with money back in your pocket – and with less stress at every step of the way! Dreading the thought of that move-out deep clean? 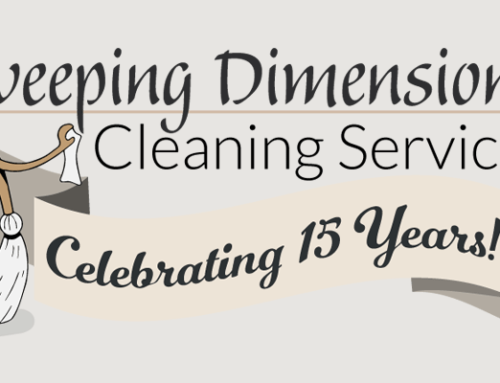 Sweeping Dimensions would love to help make things quicker and easier, you can put your focus on the most important things — like thoroughly enjoying your new space! Our professional home services take away all the stress that may arise from dealing with security deposit cleaning. 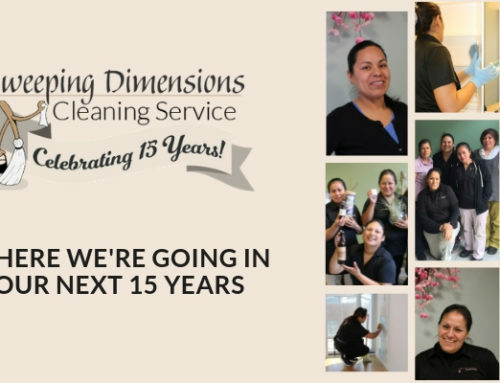 With a professionally trained and uniformed staff, all of our cleanings are fully customizable to meet your unique needs. We bring all of the cleaning supplies and equipment needed to clean your home, with a focus on green, environmentally sound cleaning products. Ready to get your space ready to show in a snap? Contact us today for your free service estimate!